Prior to viewing, I knew three things about skateboarding: 1) It’s a board with wheels, 2) I cannot ride, stand or roll on said board to save my soul, and 3) Tony Hawk is the skateboard king. Well, thanks to this funny, fast-paced documentary, I also learned that Mssr. Hawk was a member of an elite skate team headed up by our director Peralta, a group of young men who helped rejuvenate and redefine the sport, making it accessible to the masses while elevating their abilities to those of world class athletes. When the heads aren’t talking, the wheels are rolling and some of the stunts captured on screen are simply revelatory – these boys make it all look so easy, so graceful, so impossibly grand yet somehow something that anyone can do. 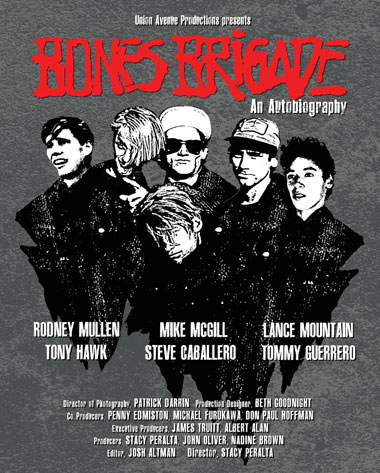 Examining the careers of professional skaters Tony Hawk, Steve Caballero, Rodney Mullen, Lance Mountain, Mike McGill and Tommy Guerrero through the eyes of the team themselves as well as their peers, we get an idea of just how much the sextet changed the sport, and how much the sport changed them. Equally intriguing is the marketing of said team – key to the financing of their extensive travel and competition budgets – without Peralta’s shrewd schemes and approach, it’s possibly skateboarding could have died out along with the yo-yo and the hula hoop. I grew up in the skate scene of that era in Southern California, so that doc completely speaks to me in so many ways. The details are dead on accurate (I was a Hosoi fan) and the perceptions of the public are actually true. If you liked that, you should check out Peralta's fist skate doc DOG TOWN AND THE Z BOYS which covers the advent of skateboarding and the old guys (like Tony Alva - who now looks like Rob Zombie) who were featured in this one. I've not yet seen DOGTOWN b/c, as I mentioned, I absolutely was not in the skate scene so I didn't imagine it would be very interesting subject matter (for me). If it hadn't been screening at Fantasia with no other films conflicting with that time slot, I probably wouldn't have seen BONES BRIGADE. But I'll tell you what - I'm damn glad that I did.